Written by: Nicole Ciacchella on July 18, 2013. 17-year-old Cael McAvoy lives in the Heartland, whose people serve the Empyrean elite, the privileged few who live in sky flotillas, high above the poisoned land. The Heartlanders live on the ground, scrabbling to get by amongst the stalks of corn so genetically enhanced they’re practically sentient beings. Little by little, the Empyreans have been stripping them of their rights, and the land is becoming an ever more inhospitable place to live. Captain of the Big Sky Scavengers, Cael is tired of playing second fiddle to the crew of the mayor’s son. Cael knows the deck is stacked against him and his crew, and he dreams of the day when he can make his own way, without having to scavenger for whatever scraps he may find. When he stumbles upon what seems to be the motherlode, Cael thinks he may finally have found his ticket out of his Empyrean-controlled life. With his newfound wealth, maybe, just maybe, he can get out from under the mayor’s son thumb, defy the Empyrean’s betrothal decrees, and get his family out of harm’s way at long last. 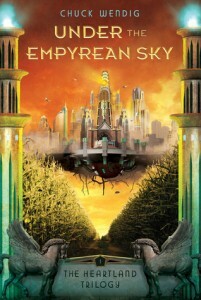 Under the Empyrean Sky was an enjoyable read that took place in a very interesting world. Steampunk isn’t really the right word for it, as it takes place in a post-apocalyptic America. Maybe cybersteampunk would be better? At any rate, it’s unlike anything I’ve read lately, and the novelty kept me interested, as did the complex plot. Cael – This is really my major point of contention with this book. If it weren’t for some of Cael’s actions, this would have been an unquestioned rave review. Though Cael has a tendency to go off half-cocked time and again, I understood his frustration and his desperate need to find a solution to his problems, to break free from the corrupt officials working to oppress not just him but everyone in Heartland. But I have a serious issue with the way Cael treats Gwennie, the girl with whom he purports to be in love. Whenever he’s upset with her–and it’s important to note here that many of his reasons for being upset with her are due to circumstances beyond her control–he resorts to things like saying she’s wearing “whore paint”. This book is the first in a trilogy, so I’m hoping at some point Wendig will address the seriousness of Cael’s using such language against a woman he says he loves. There needs to be some sort of reckoning. If there isn’t, it will be a major black mark against this series as a whole. Gwennie – She’s 100% underdeveloped in this book. I’m hoping she’ll be more fleshed out in future installments in the trilogy but, for now, all the reader really knows about her is what is said by the other characters. Considering Cael’s treatment of Gwennie, anything he says is suspect anyway, so I don’t find his information reliable. For the most part Gwennie is off camera, though she does come in at the end of the book, at long last giving the reader a glimpse of who she actually is. The setting – I have no complaints about it. None at all. Wendig describes his world so vividly that I was fully drawn into it, and I could picture it perfectly. From the weird corn, to the floating landships the crews used for scavenging, to the warped genetics that wreck havoc on Heartland’s residents, this was an entirely realized world. One of the things I’m most excited about, from the standpoint of its being a trilogy, is the thought that I’ll get to see more of the world, and hopefully at least a little of the Empyrean flotilla. This book concentrates on Heartland and the world on the ground, but it does offer some very tantalizing glimpses of what the Empyrean is like. The social strata – Given the setting, Wendig has created a society that makes sense. The Empyrean are the elites and, in general, anyone who isn’t Empyrean is mistreated, but this doesn’t mean that all the other factions of characters band together. I thought the way the Heartlanders drew distinctions between themselves and the people they referred to as hobos was very realistic. There are some heavy hints about insurgent groups, and I liked that Wendig’s description of them was gray. Some of the characters think they sound great, others think the insurgents are bad guys too. I’m interested to see how this will play out in the other books in the trilogy. The themes – There are a lot of them in this book, but none of them are dealt with in a preachy way. Everything from environmental issues to oppression to LGBT issues come to play in this book, but they all feel very organic. At no point did I feel like Wendig was trying to work things in, or like he had some sort of checklist of issues he wanted to include. Due to the way the world is structured, it made sense for all these different issues to be present. The secondary characters – I loved how Wendig gave the reader glimpses into the motivations and perspectives of various characters. Just when I started thinking one of them was cardboard, Wendig would throw something in that made me rethink the character. There are some I’d like to see better developed, and there are a few cliches, but it’s obvious that Wendig doesn’t just throw a character in the mix in order to fulfill a plot need, he considers what motivates the character to behave as they do, and the book is all the richer for it. 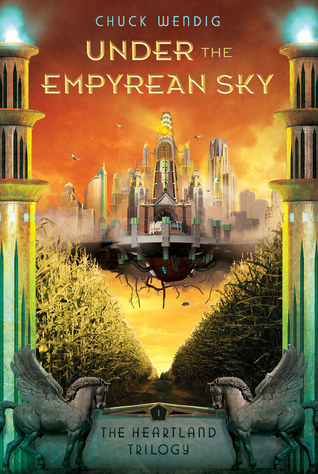 Under the Empyrean Sky was one of those books I took a chance on. The blurb sounded interesting, but it also sounded a little outside of my usual purview. I’m glad I decided to go ahead and read it because it was one of the most imaginative, enjoyable books I’ve read in some time.